What is the Patient Experience Gumball Postulate? This is my gumball machine. There are many like it but this one is mine. Without me my gumball machine is useless—a paraphrase from Full Metal Jacket. The gumball postulate states: Most times you will have a gumball experience that gives you a gumball that is not the color you wanted. The only problem I have with gumball machines is that although you know you will get a piece of gum for a penny, you never know what color the gum will be until you have spent the penny. There are eight colors of gum in my machine. I like the greens, yellow, and purples. Hence, for any given turn of the dial I have a thirty-seven and a half percent chance of being satisfied. At the outset, assuming there is an even distribution of the gumball colors in the glass jar, the chance that I will be dissatisfied with each expenditure of a penny is greater than sixty-percent. Not great odds. From the perspective of a customer, they know from their prior experiences that their experience of having to interact with any organization, with your organization, will be a whole lot worse for them than getting the wrong color of gumball. But the principle is the same. The experience doesn’t depend on anything that was planned. It does not depend on anything that was designed. The quality of their experience, and their satisfaction with that experience depends on one thing—random selection. Green gumball; red, white, or purple. The healthcare postulate states: Most times you will have an experience that is not the one you wanted. Now some of you will argue that your organization is committed to improving patient experience, and you will cite actions like employing a parking valet service, and improving the food in the cafeteria. It may be worth noting that the management team parks their cars and eats in the cafeteria, but maybe that had nothing to do with why those services were improved. One thing the management team does not do is call the hospital. They do not know how many times someone has to call to schedule an appointment, to speak with a nurse, or to get someone to help them understand their bill. Suppose you were bold enough to call more than once, and that you asked the same question to each person with whom you spoke. Would you get the same answer from each person? Of course not. Don’t believe me; try it. Do you know why people call your institution? Try to write a list about why you believe people call. Hint: if your list contains fewer than twenty items, you probably do not know why they call. And, if you do not know why they call, how can you possibly expect to answer their questions when they call? So where are we? We do not know what type of experience people have when they call, and we do not know why they call. That said, can there be any doubt that what they experience when they interact with your organization is poor? The solution to this problem is not a software package. Software is a tool. The solution comes from knowing why people contact your organization, and knowing what they expect from your organization when they make contact. Without knowing the answers inside-and-out to those two items means the experiences will continue to be poor. Once you know those answers you must design an experience that provides each person exactly what they want every time they call you or go to your website. If you think that is impossible, go to the websites of Amazon or eBay. Look for a phone number to call that will allow you to speak with someone about anything; customer service, accounts receivable, customer returns, and shipping. Is that because they do not want to talk to you? Is it because they do not want you to talk to them? Of course not. It is because they inventoried all of their business processes, and then they designed a way, one way, to ensure that each interaction was tailored to solve that business process the very first time the person needed it solved. They designed it so that it works for every business process and so that it works for every person every time and on every device. Here’s a freebie for playing along. Chances are good that the people who answer the phones at your organization do so only between the hours of 8 A.M. and 6 P.M. Monday through Friday. Why not at least offer your patients and customers the same opportunity to reach you as Comcast and Verizon offer their customers? That is a low threshold, but certainly not one your organization should be below. Now if you have made it this far, you might suspect that I am a huge advocate of call centers. I am not. I am a huge advocate of the notion that says if you are going to interact with your patients and customers by phone that that interaction should be remarkable. 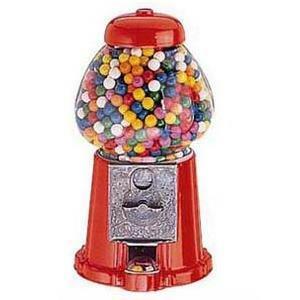 It is a lot easier to improve the gumball machine customer experience. All I have to do is use the key, open the top, and select the best experience. The future for patient/customer interaction lies with self-service on the web. If you are interested, this link takes you to a PowerPoint deck that addresses that point.